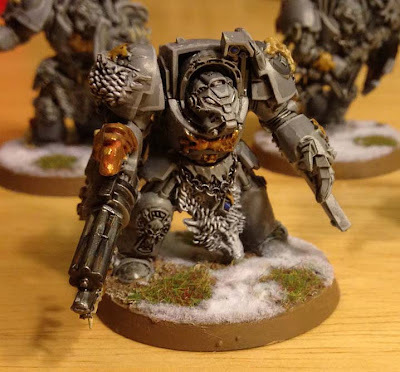 When I posted my Space Wolf painting tutorial the other week, I figured it would get some response and there might be the occasional person who picked it up and tried it on their own. Army Undecided has done that very thing with his Space Wolf army painted up in a light grey like I did with my own test model. I think he's got a great looking tabletop ready force. The thing I like most though are the bases. He's got grass and snow on the base at the same time and that's not something you see often. Most of the time we all leave the grass off when we add snow, I'm guilty of it myself. Everyone gets the Forge World emails. Lots of folks repost it on their blogs too... enough that you don't really need to subscribe the the original email anymore. 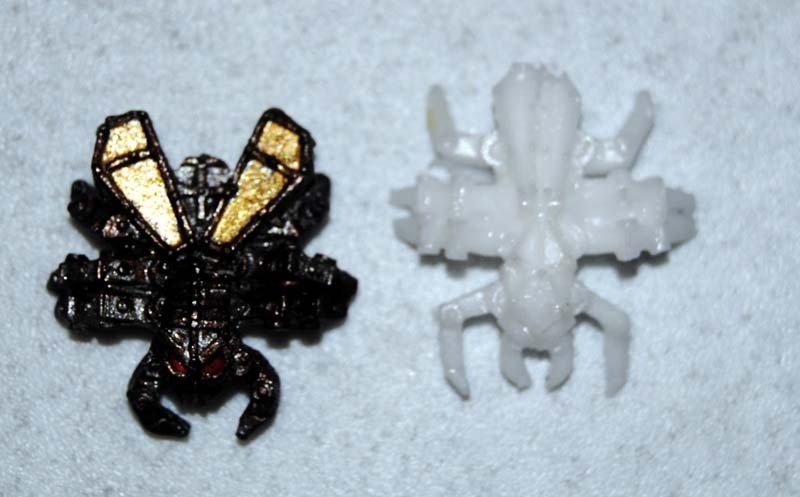 This past week though, they released their version of a Necron Scarab Swarm (their pic on the right over there). Honestly, I'm a little disappointed. I like the old school look, but it doesn't say swarm to me. Not like their Tyranid ripper swarms do. Those say swarm to me. Maybe I just want more on the base to give me that feeling of a carpet of them scampering across the surface of the battlefield and four bugs just don't do it. Some folks have taken my idea/technique and improved on it. 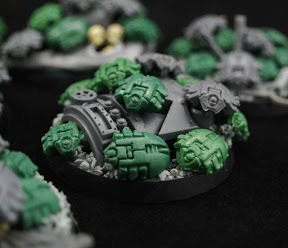 Like Eye of Error did the other month with his scarab swarms and including some mechanical bits on his bases. The addition of more scarabs along with a themed base makes all the difference in the world to me. It's finding those little things you can do to your army that matter. They don't have to be really complex or difficult to do, but it's a matter of finding the right touches. That's what makes the difference and Eye of Error hit the nail on the head with his swarms. You can see more of his scarab swarm bases here. Another reader, Narceron, has used resin and some old school metal scarabs to create something similar. He's still in the building process I think, but I'm hoping he really loads them onto his bases a well and doesn't just go with 3 or 4 on each base. I know he has tons of these guys made already and I'm waiting to see how they turn out in the end. You can see his progress post here. I don't know - four of those old scarabs would more than fill up a base. They're pretty huge. MasterSlowPoke: I'm of the thought it's a swarm so load them on. Five or six to really get that crushing wave of metal look. Maybe it's a good thing I don't play Necrons. 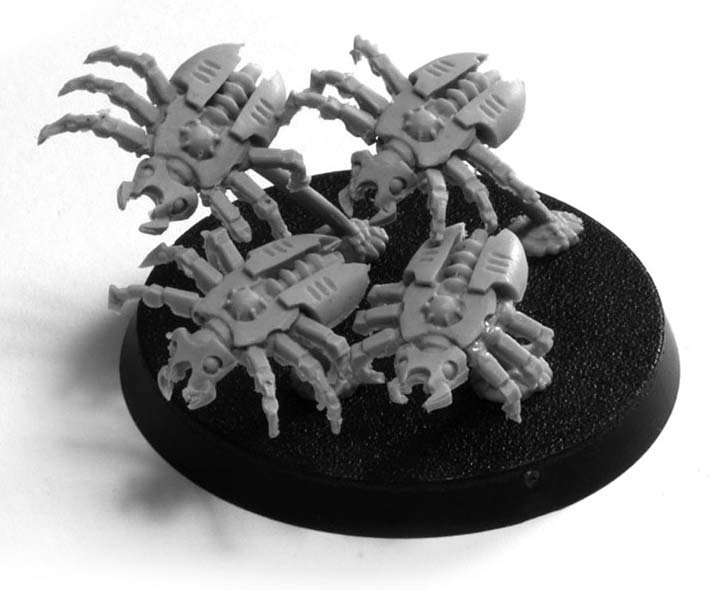 I do like the design of the FW scarabs, though just not as Necron models. The normal plastic ones, especially when given a true Swarm workover, do the job a lot better in my opinion. LuckyNo.5 did a great job on his swarms, they really communicate that 'living carpet of nastiness'-feeling! Hephesto: I like the smaller GW ones myself as well. And I also agree that LuckyNo.5 did a great job with his swarms. That was the point of sharing these posts, to show what others are doing with some of the stuff that is shared here. Thanks for the post! Pretty awesome to see my Wolves up here. I've already moved onto my Grey Hunter squads, can't say thanks enough for sharing the scheme, they are just as easy to paint as the terminators. I freakin' love it.